May is such an exciting month. Not only is Rocking Horse Hill out there on the shelves, I’m getting out and about too. 10 am Friday 9th May, Penrith NSW. Join me and good buddy Rachael Johns this Friday, at Penrith City Library, 601 High Street, Penrith NSW. Come along if you can. This one’s going to be a blast! 7pm Tuesday 20th May, Mount Gambier Library, SA. 5pm – 7pm Wednesday 21st May, Hamilton Library, Victoria. 10am Thursday 22nd May. Balmoral Bush Nursing Centre. Bell Street, Balmoral, Victoria. 10-30am for an 11am start, Thursday 12th June. Hawkesbury Library. Deerubbin Centre, Windsor NSW. Come along if you can. I’d love to see you! 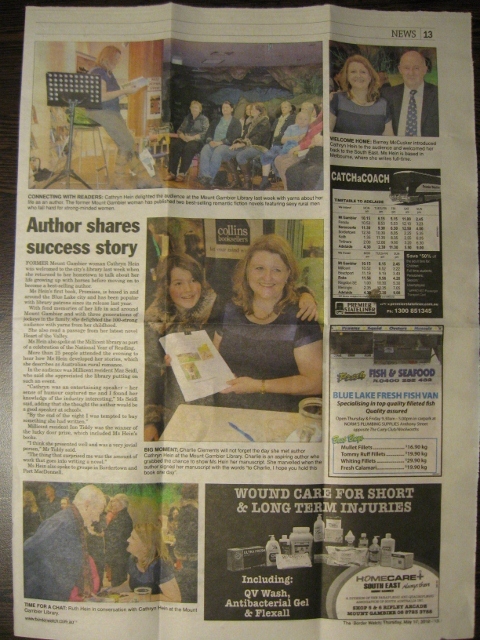 This entry was posted in News, Rocking Horse Hill and tagged Australian Authors, Australian fiction, Australian novels, Australian romance authors, Australian Writers, Author Events, Cathryn Hein, Cathryn Hein events, Rachael Johns, Rocking Horse Hill, Rocking Horse Hill by Cathryn Hein, rural fiction, Rural lit, rural romance on May 7, 2014 by Cathryn Hein. 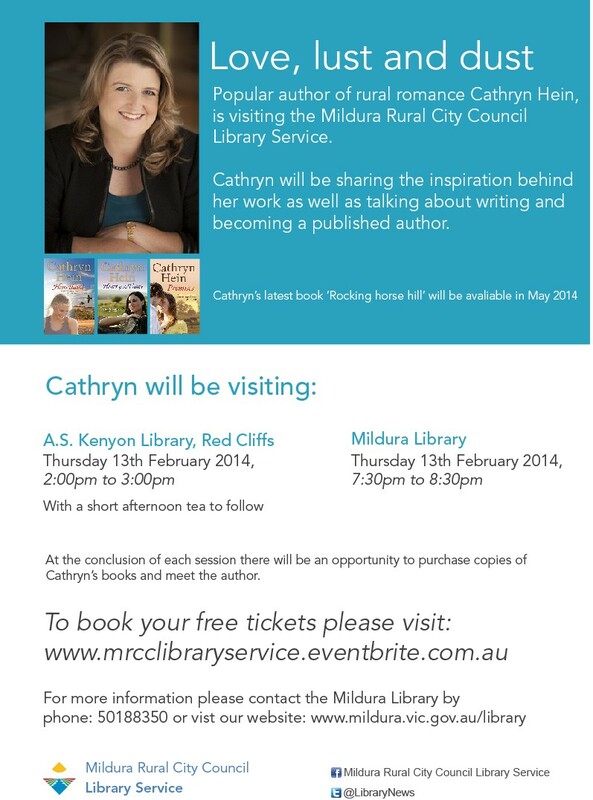 If you’re in the area, I’m talking at Red Cliff’s Library this afternoon and Mildura Library this evening. Would love to see you. There’ll be lucky door prizes too. 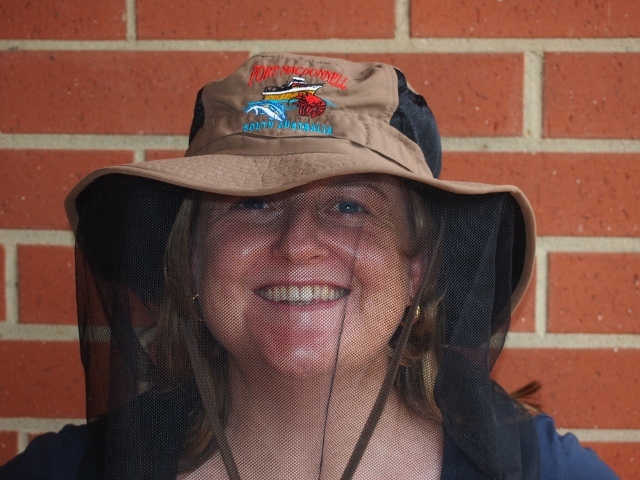 This entry was posted in News and tagged Australian Authors, Australian romance authors, Australian Writers, Author Events, Cathryn Hein, Mildura Library, Red Cliffs Library, rural romance, Sunraysia on February 13, 2014 by cathrynhein.